The lovely and I are heading to Boston for a couple of days, but I will be remaining in contact as the trusty laptop is going with. On to corkscrews! 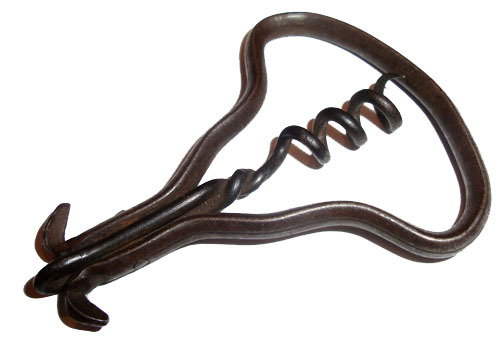 For the longest time, I have been intrigued by a simple bow corkscrew that resembles a belt buckle. And, Peter has one on his website for some time. And, while I could have forked over the money for it, I always assumed that eventually it would simple come to me in part of a trade. Well, as luck would have it, I picked a small lot of corkscrews on eBay the other day, and a remarkably similar corkscrew was contained therein. I was quite excited to be getting this little package of corkscrews, and then…I opened the box. Apparently the seller, or someone that the seller bought these items from previously had decided to coat the bow in black paint. It is a fantastic finish on the item, quite pretty really, but when we get back from Boston, a few chemicals and a little elbow grease will hopefully unveil the original unpainted corkscrew underneath the black. another addition for the Frary page! Now that the Frary page is up and running, the offers of Frarys for sale are just pouring in!!!! Okay, maybe NOT pouring, but one offer did come through yesterday. And, a deal was agreed upon. This version of the Frary is very simple, it will be a welcome addition to the collection. I will be adding it to the website shortly. And, feel free to offer your Frary Corkscrews if you have any!!! I have had several Ross Pigs over the years, and a couple of Negbaur pigs, but one of the piggy corkscrews that I have been most desirous of acquiring was the Goberg pig corkscrew. Well, it would seem the Piggy Corkscrew Gods are shining down on Vinalhaven, as Hugo Berger’s creation will soon be making his way to the island! It has been 4 years running that a Barnes patent corkscrew–or variation of the esteemed Mr. Joshua Barnes’ patents–has made the best 6 of the year. And, to be perfectly frank, I do seek these little guys out. Seeking doesn’t always pay off mind you, but I do keep my eyes open for the telling shape. And, last week there was a lot of corkscrews listed on eBay–not a lot, meaning many–a collection of corkscrews in a single lot. And, therein was an interesting little Barnes corkscrew; a version of the patent that Williamson sold. That said, I think it definitely fits within the Barnes patent family. So, I put the item on my watch list, and noticed that slowly the listing’s price was creeping up. Not hard to do, given the ninety-five cent opening bid. Given there were bids, and no buy it now option, I did have time to search around for a reference for the piece. I had seen this before referred to as a Barnes, and ultimately Screwbase confirmed this. With this information, I placed a snipe bid, and as of this morning’s email/coffee session, I had won the auction and the Barnes will be heading to the collection. Now, there are three other Barnes’ corkscrews (perhaps four) that I am still after. One is a folding bow that has a collar–much like the Jopson patent, one is a single finger pull with double helix as shown in O’Leary page 41, and finally in the patent drawings there is shown a double helix folding bow. As far as I know, no one has ever seen one of these. The fourth?, I am not sure, but you never know what will turn up!!!! For now, we have number 5…and, this may call for a Joshua Barnes Corkscrews page on the website. I will update the blog once it is up and running. And, if you have a Barnes Patent–or variation of a Barnes patent–or any catalog references or information about Mr. Barnes and his corkscrews that you wish to share, I will gladly add it to the page and give you credit. Or, alternatively, I will gladly trade for the corkscrews/info. An interesting henshall-type corkscrew arrived in the mail today. It was expected. I mean, it isn’t like people are simply sending corkscrews to my p.o. box without me knowing about it. Although that would be pretty awesome. That said, the corkscrew is pretty cool. It may stay in the collection, or it may go up for trade… I am not sure yet… Any offers? On the building/renovation front, we will be building walls tomorrow. The place is really taking shape! ! ! Pictures soon!!! So, I decided it would be a good idea to start emailing a few collectors to see if there might be a Frary corkscrew available for trade out there. And, lo and behold there was. The details of the deal haven’t been worked out quite yet; we shall see if the deal goes through in the coming days. back from Portland, and the camel! The lovely bride and I are back from a fantastic evening in Portland, Maine. It was a fabulous time, and tomorrow we get back to work on the building–what has happened on it recently? Well, the vault was completely destroyed! Jackhammers and torches took care of that. And, now the subfloor has been ripped up, stringers replaced, and we are in the process of insulating and replacing the subfloor. This will be followed by repair of the roof, new walls, electrical, plumbing, and finally the facade. If all goes well, the wine store–which will be housed therein, will be open by May 1!!!!! Speaking of wine (and corkscrews) , the camel arrived and it is quite handsome! He will definitely be making the best 6 of the year! And, there is rumor of a Frary trade. More on that if it comes to fruition! Yes… a hunch; a chance. A relatively educated guess if you will. Last night, I was just getting back from rehearsal (a story for another day) when I happened over to the computer and checked email–and eBay–and the 14th item down from the top was a selection of barware, with a buy it now. However, the photo doesn’t really show much detail of the items. I looked closely at the photo–or as the case was, as close as possible with a poor photo–and could make out a familiar outline. Or, were my eyes deceiving me. I went back to the eBay listing, and looked again. The shape was familiar… Even though it seemed to be covered by another item. It is a hunch after all, so I could be completely wrong, but it looks to be a Hagenauer dog corkscrew. And, given the price of the entire lot of stuff included, it is worth taking a chance! And, well… I might as well go for it! So, I clicked the buy it now, and soon enough we will know for sure. Hagenauer? or Not Hagenauer… was my hunch right? What do you think? today is the lovely’s birthday!! !